Is it safe to dive if you suffer from Marfan syndrome? My 34 year old husband has this condition & would like advice. The thought of a 6 foot 5 superwoman hurling a volleyball at you at 110 mph is seriously disconcerting, but one of the game’s best female players, Flo “The Clutchman” Hyman, had Marfan syndrome. Some even speculate that the world’s favourite terrorist Osama bin Laden is a sufferer, based on his tall size, use of a cane and rumoured heart disease. Named after the French paediatrician who first described it (see Jules, they were good at something), it’s a genetic disorder affecting men and women equally, which is most often inherited, although it can arise from new mutations in 15-30% of cases. The defective gene causes problems with the elastic proteins found in the connective tissues of the ligaments, major blood vessels (the aorta in particular) and many other areas. So the resultant symptoms and signs include great height, long, slender limbs and a wide handspan (the composer Rachmaninov was another famous case, as anyone who has tried to play his ludicrously difficult piano music will know.) These manifestations would seem to be pretty useful in the aquatic world: carving through the water like the Thorpedo with zero resistance and great big paddles for feet and hands. However some of the other consequences are of more detrimental import to diving, including chest wall deformities, curvature of the spine, and, more seriously, abnormalities of the aorta and heart valves. The condition often goes undiagnosed until complications occur: poor Flo was only 31 years old when she died on the courtside after being substituted during a game in Japan in 1986. Her death was due to aortic dissection (resulting from her previously undiagnosed Marfan), where a tear in the wall of the aorta causes blood to flow between the layers, forcing them apart – a medical emergency which can quickly lead to death. Once diagnosed, treatment of Marfan involves regular heart checks with the aim of slowing the damage to heart valves and the aorta. There are also some procedures that can correct the skeletal problems if they are severe. The biggest risk in terms of diving with Marfan is its effect on the lungs. The chest wall deformities (including the so-called “caved in” chest, and spinal curvature) can restrict lung expansion, and Marfan is a risk factor for spontaneous pneumothorax (or collapsed lung). About 10% of patients have some lung abnormality, and there are case reports of lung collapse occurring even with the relatively small pressure changes of mountain climbing and ascent/descent in pressurised planes. So you can imagine that there is a quite a significant risk of lung problems given the large pressure changes that occur in the first few metres of a dive. My advice would be to steer clear and adopt a slightly less dangerous activity. Hello. I want to try diving but when I was pregnant last year I was diagnosed with sickle cell trait. My doctor doesn't know whether it's safe for me to dive, and I've heard about sickle cell disease and I'm not sure what the difference is, if there is one. Can you clear up my confusion? And, better still, tell me I can dive?! OK, let's do a basic biology lesson first. Red blood cells have evolved a particular shape to help them flow easily through blood vessels, the so-called "bi-concave disc". Imagine two Frisbees opposite each other and squashed in the middle. Or a doughnut with a thin flat piece filling the hole. Mmm, doughnuts. In sickle-cell disease, an abnormal form of haemoglobin (HbS) means that the red cells become distorted into a sickle shape. These get stuck in blood vessels, cutting off blood supply to tissues further on, which leads to organ damage and painful "crises", which can be completely incapacitating. It is genetically inherited: if both genes code for HbS, then a person will develop sickle cell disease, but if only one HbS gene is inherited (and the other gene is normal HbA), then you have sickle cell trait. Those with trait only are (relatively) lucky – they don’t develop the full-blown disease, but are carriers. The distinction is important, as we shall see. It is a lifelong condition, and most often found in those of Afro-Caribbean origin. The reason for this is interesting: having sickle-shaped red cells protects a person from malaria, and so it is relatively common in areas where malaria is endemic. In certain parts of Africa sickle cell disease is known as ogbanjes ('children who come and go'), because the infant mortality rate is so high. Unfortunately, if you have sickle cell disease, diving is out. The increased risks of DCI and precipitating a sickle cell "crisis" are too great. For those with the trait the situation is a bit more controversial. Some authorities cite evidence that low oxygen levels can trigger sickling and crises, but others quite reasonably point out that in these conditions (eg. out of air/equipment failure situations), drowning would be more of a worry, and the sickling is irrelevant. I tend to agree with this last point. Those with trait are very unlikely to develop any dive-related problems under normal conditions. Our 9 year old son is a keen swimmer and enjoys weekly snorkelling and life saving lessons at his local swimming club. My husband is a regular scuba diver and our boy is starting to take an interest. However he was diagnosed with cystic fibrosis (CF) late last year. He is generally fit and well, pancreatic sufficient, has no persistent cough nor nasal mucus, and apart from when he has a bad cold he is like a normal, happy 9 year old. Do you have any knowledge of research or views on the potential for children suffering from CF to dive? Would it be totally unsafe for him to participate in this sport when he is older due to lung pressure or would he be safe to scuba dive to a certain depth? Apparently in the US, children call this illness "65 Roses" as it's easier to pronounce. Cystic fibrosis was spotlit recently by "A Boy Called Alex", a great TV antidote to the currently ubiquitous teenage hoodie tales. The story of Alex's quest to put on a choral performance at Eton (where he is a music scholar) in the face of frequent hospitalisations was one of those inspirational "life is what you make it" yarns. CF is the most common genetic disease in Europeans. The mutated gene causes production of thickened mucus in the lungs, and similar thickening of digestive juices in the pancreas leads to difficulty absorbing nutrients and vitamins, with consequent malnutrition. Cases can be diagnosed before birth with genetic testing, but unfortunately CF is presently incurable, and many die young, often in their 20s or 30s. There are several difficulties I can envisage with diving. The thickened mucus tends to clog up sinuses and nasal passages, which increases the chances of infections, polyp formation and equalising problems. The same thick mucus in the lungs could also cause blockages and plugging in the small airways, with possible air trapping and the risk of pulmonary barotrauma and air embolism. All these thickened secretions are perfect havens for bugs to breed in, and regulators or snorkels could spread infection to a CF sufferer. But these days life expectancy is on the increase thanks to new treatments, and in some children there is very little lung involvement. Your son's consultant will be familiar with the condition of his chest in terms of infection, damage and associated asthma. If chest disease is minimal, precautions are taken and any risk is understood, diving might be possible, but you would need to be certain that the problems outlined above were dealt with. I have been diagnosed with EDS (Ehlers Danlos Syndrome, not sure which type but either classical or hypermobile). I get a lot of pain in my joints, muscles and nerves (and sometimes pins and needles in feet and hands). I also have bulging discs in my neck, occasional bouts of sciatica, and a winging shoulder blade (which causes a lot of thoracic nerve pain on a regular basis). Should any of this stop me from diving? Carrying tanks, weights, etc while diving didn't seem to bother me in the past. Also, I was wondering if you think joint instability/EDS type defects would predispose you in any way to DCS? I know there won't be any research on something like this but I was just wondering about the physiology of it all and if you could see a link in theory. The word collagen tends to conjure up images of voluptuous pouty lips. Think Angelina, Scarlett… Still with me? In fact, collagen is found all over the body, being the major constituent of ligaments, tendons, bones and cartilage. The word actually means “glue producer”, referring to the boiling of animal joints to produce glue, a process that goes back 8000 years. Ehlers-Danlos syndrome (EDS) is a group of genetic disorders, whose common feature is defective or inadequate amounts of collagen. 2 doctors (you can probably guess their names) discovered Ehlers-Danlos syndrome (EDS) in the early 1900’s. The commonest type involves so-called “hypermobile” joints, contortions of which were the the stock-in-trade of such Victorian circus performers as “The Elastic Lady” and “The Human Pretzel”. The “demon violinist” Paganini had exceptionally long flexible fingers which enabled him to pioneer virtuoso techniques – he is thought to have had the hypermobile EDS variant. And so to diving. The issues I would anticipate are several. Due to the laxity of the joints, dislocations are common, so hauling your wet self and gear up a ladder in choppy waters might put you at high risk of a popped shoulder or hip. 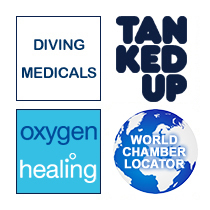 Degenerative joint disease can occur, which might render the joints more susceptible to damage from microbubbles in the long term, similarly to commercial divers. The pins and needles you experience could present us with the old diagnostic conundrum – is this your EDS or DCI? So being very aware of your pre-dive condition takes on extra importance. The other possibility is mitral valve prolapse (MVP), where the defective collagen renders one of the heart valves very floppy. MVP is quite common (5-7% of the population), and in general quite benign, but it can sometimes cause chest pains, palpitations, and breathlessness, depending on the degree of “leakiness” of the valve. I don’t think any of this rules out diving completely, but sensible precautions and regular check ups would flag up any potential problems before they suddenly became apparent underwater.